Save Money buying in bulk! Purchase any 5 Glasstic Style Inserts and pay $1.00 each. That is a 50% Savings over purchasing them individually! The Style Insert is lamintated to make it waterproof. Replacements are freely available. 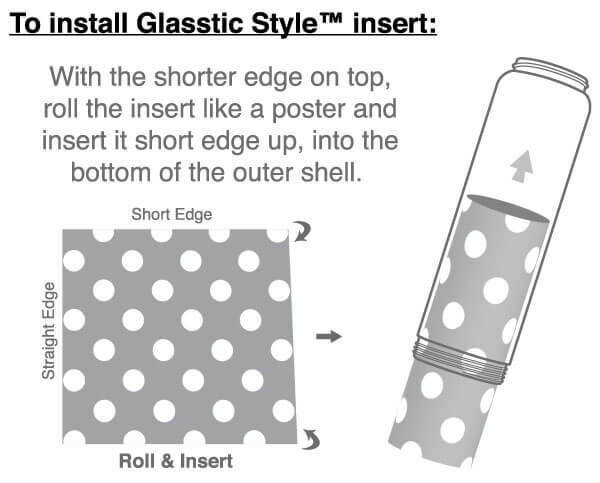 Install in an outer shell by rolling the Glasstic Style Insert up along the angled edge and inserting the short edge into the bottom of the outer shell. Unroll inside the outer shell and line up the seams to straighten out. Twist inside shell to change position of the Style. Remove by lifting edge of Style Insert from inside shell using a fingernail (pulling apart at the seam from the top and grabbing an edge works too) or toothpick to simply peel up an edge of the Style Insert and roll up before pulling out the bottom or top of the shell. Replace in package or put in a folder or under a book to flatten out when not being used. Disclaimer:The four design bottles - Peace, Retro, Tribal Yin Yang and Love are not ideal for use with the Glasstic Styleᵀᴹ inserts as the designs are printed around the outside of the protective shell, making it difficult to see the Glasstic Styleᵀᴹ insert which is placed on the inside between the outer shell and glass insert. For this reason, we recommend using the Glasstic Styleᵀᴹ inserts with the regular branded or custom design logo bottles.